Batman and Robin, Lucy and Ethel, sales and marketing: Some dynamic duos are destined to do great things together, and sometimes all that’s required is good communication. For sales and marketing teams working together to build and improve their sales pipelines, sharing data, insights, and information more often can lead to greater alignment and allows teams to make more progress toward their goals. 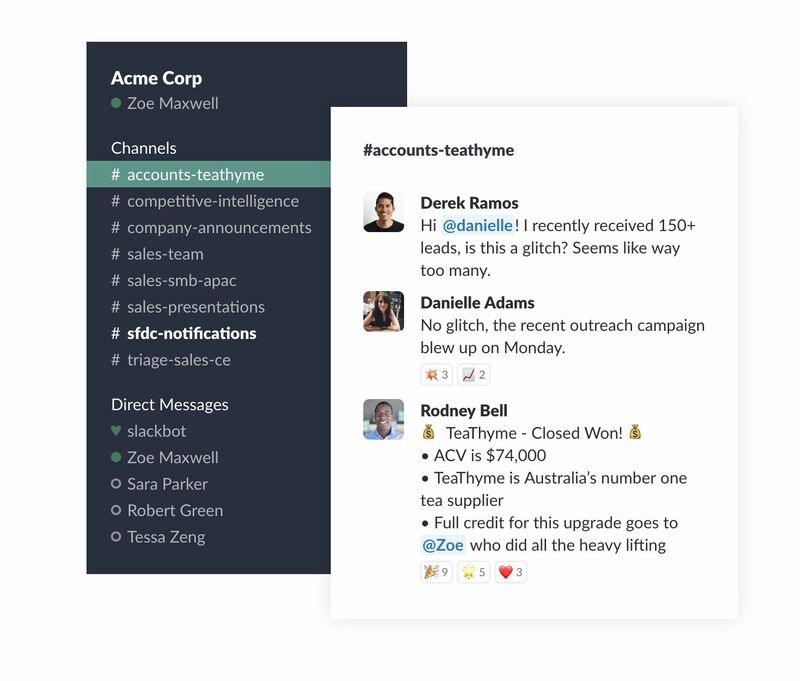 One way to create cohesion between these two groups in Slack is by adding various sales and marketing tools — like the ones we’ve listed below — to your Slack workspace. You can easily set up different apps to automatically post analytics summaries to public Slack channels, which makes that information available to team members and leaders from both teams. This way, everyone has visibility into how things are progressing and quickly identify and troubleshoot issues. The result of this thoroughly coordinated effort? Shorter sales cycles — from lead generation to signed contract (likely followed by a spike in celebratory reacjis posted to your #deals and #accounts channel). 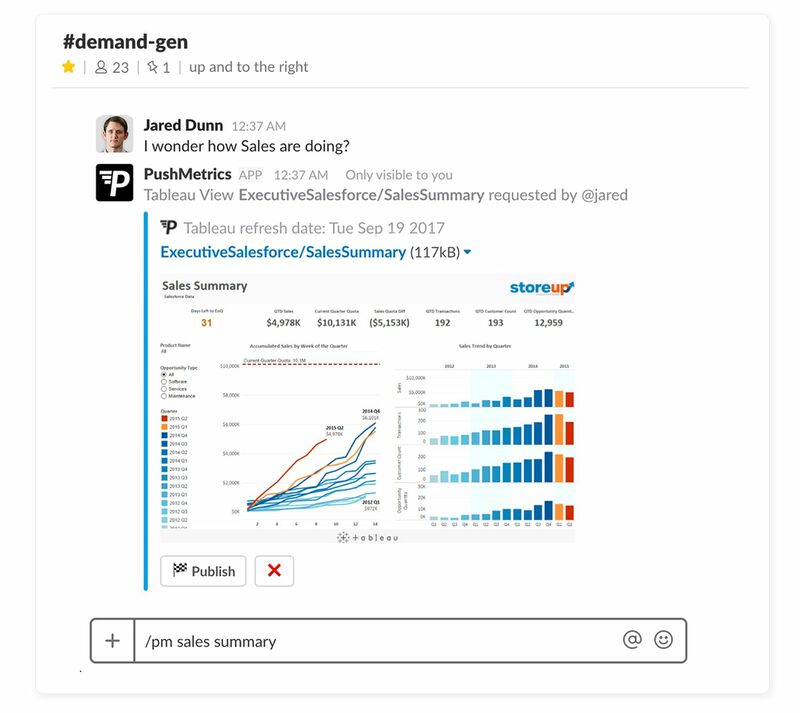 Use Troops to schedule or pull any of your existing Salesforce reports into Slack channels or DMs. 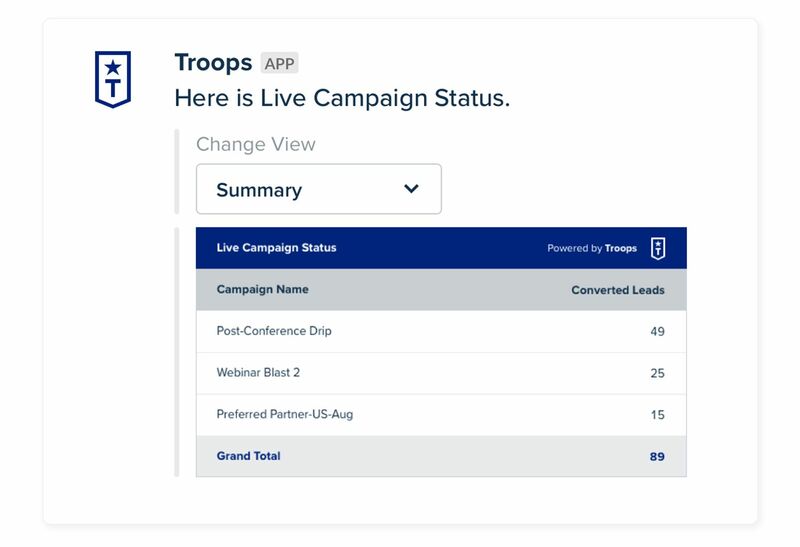 Troops also gives people visibility into new leads and conversion rate summaries, making it easier to identify whether campaign strategies are on target or missing the mark. Try it out — Have automated reports sent from a live campaign to a public Slack channel of your choosing, like #Q1-outbound. When a prospective customer reaches a new milestone, it’s almost guaranteed there’s a salesperson somewhere in the organization who could benefit from that knowledge. 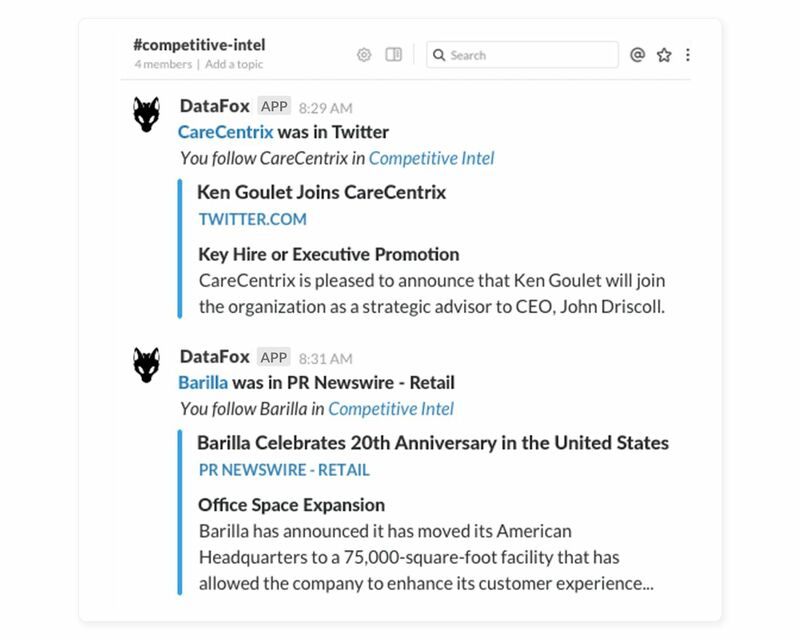 Enter DataFox, a service that updates you on what’s happening with target customers — like the opening of their new office, a new executive hire, or the launch of a new product — and also alerts you when prospects have reached certain sales criteria (headcount, revenue, sector, etc.). With fine-tuned alerts on both existing and new prospects, there will be no doubts about when to reach out. Try it out — Add DataFox to your #smb-sales channel to start getting notifications when customers reach key milestones. Mode — Mode is an analytics platform that combines SQL, Python, and other reporting tools in one place. This Slack integration allows you to instantly share ad hoc analysis in public channels or push dashboard updates into Slack on a scheduled basis. Baremetrics — Baremetrics is an analytics and monitoring tool that gives you access to hundreds of metrics and insights for your subscription business. This Slack integration sends you instant notifications (Charges, New Customers, Cancellations, etc. ), as well as daily, weekly, and monthly revenue reports. You can also pull up customer health information like LTV and MRR right from Slack. PushMetrics and Kiwi — These apps connect with Tableau so you can send the dashboard summaries directly into Slack with automated reporting. Looker — Looker is a business intelligence platform that connects disparate data sources like Google Analytics, Salesforce, and your internal data into one centralized view so you can monitor your entire funnel from site visit to renewal and expansion. Try it out — Use one of these apps to connect Slack with your critical business data and schedule a revenue summary report to post into channels like #bizops automatically. The Sally app for Slack from Gainsight makes real-time customer data and insights easily accessible to the whole team. You can ask Sally a range of questions about your portfolio, including summaries of customer survey scores from NPS, key sponsors, and more. 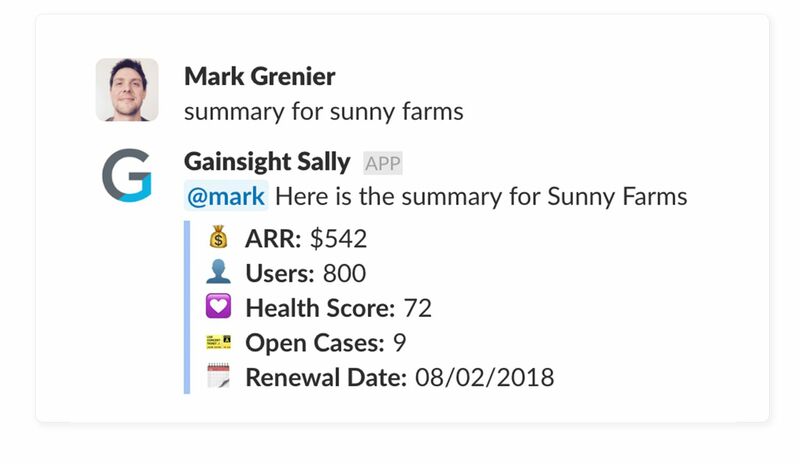 Try it out — Add the Gainsight app to your Slack workspace and ask the bot for summaries of your top customers directly from any Slack channel. The various Slack apps and integrations in the Slack App Directory are designed to speed up communication and collaboration across teams, making it easier for them to congregate around shared data and seize new opportunities. Discover more ways to integrate your tools with Slack in the sales, marketing, and analytics categories of our app directory.